We were definitely under dressed for the occasion. Jackets, ties and dress pants were an unspoken requirement. Buttoned down shirts paired with slacks definitely didn't fit that bill. But then again, attire was the last thing on our minds after a 26 hr transit flight from Singapore to Paris. 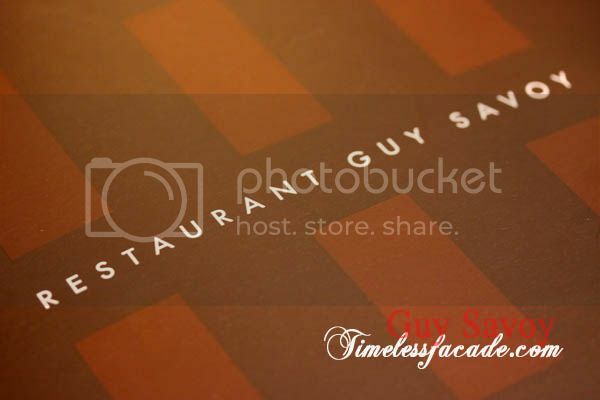 The name Guy Savoy (pronounced Gee Sav Wah) might seem familiar, with the eponymous 3 Michelin star restaurant opening an outlet at Marina Bay Sands in the very near future. The chef's motto? "Cuisine is the art of instantaneously turning produce suffused with history into happiness." 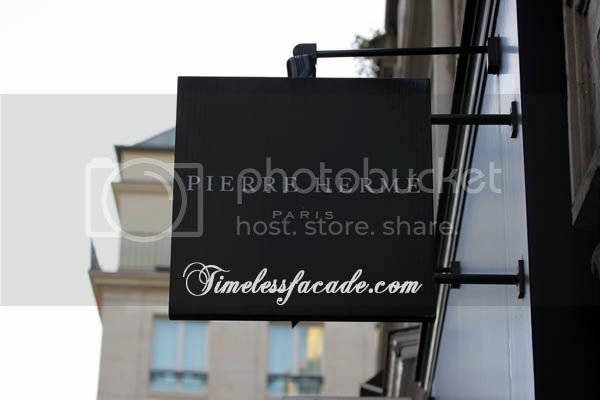 The restaurant is a short walk from the historical Arc de Triomphe, at the start of rue Troyon and boasts an interior designed by the famous Jean-Michel Wilmotte, who also worked on the new Louvre Museum in Paris. Simplistic with luxury undertones resonating from dark paneled walls and rich leather. Decidedly modern. We started off with a very casual foie gras terrine speared with toast that didn't overwhelm with its rawness. Subtle, smooth and silky. So good that we had seconds. The cream of carrot came across as thick and flavourful without being overly creamy. Hidden below the other half of the cup of soup was a "chef's surprise", which reminded me of samosa stuffed with vegetables. 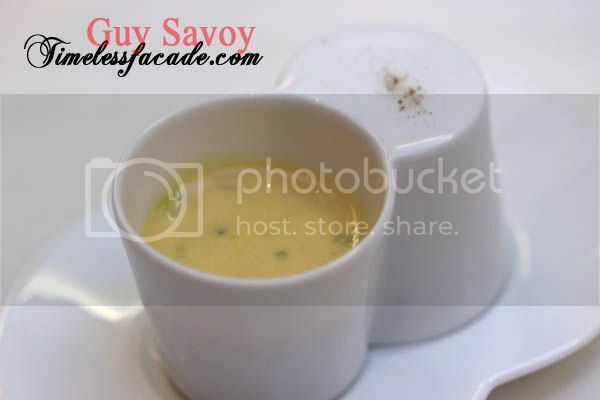 A signature dish of Guy Savoy, the artichoke and black truffle soup was nothing short of excellent. 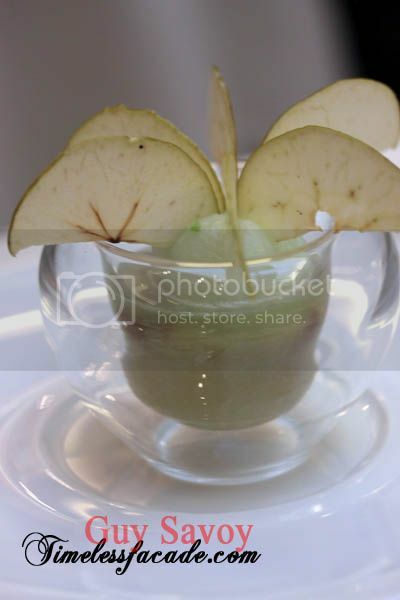 Silky, rich, fragrant and made from pure artichoke puree, the soup was layered with slices of Parmesan cheese. Served up with Brioche Feuilletée aux Champignons et Truffes (Brioche Puff Pastry with Mushrooms & Truffles), this is a must have for truffles fan. The brioche came layered with mushrooms with truffle butter spread atop - soft on the inside and flaky on the outside with a heavy dosage of sinfully smooth and tasty truffle butter. I jumped at the opportunity for an extra serving of the brioche to mop up the velvety soup. The John Dory fillets were perfectly grilled with a touch of fishiness intact. 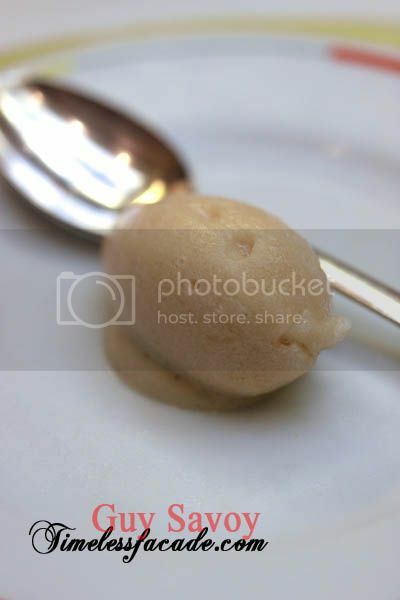 Subtly smooth with portions big enough to pass off as a main in a fine dining restaurant in Singapore. 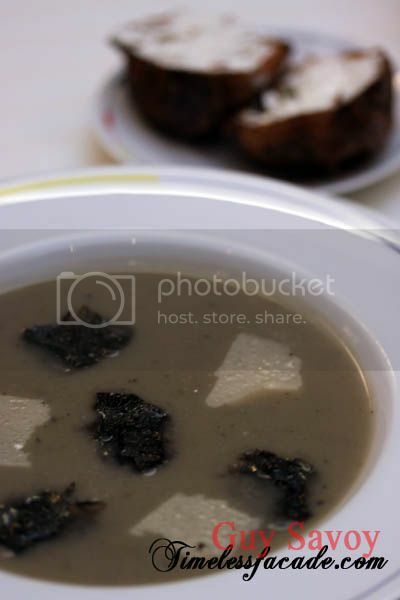 I didn't quite take to the Jerusalem artichokes though, which apparently was titled "best soup vegetable" in the 2002 Nice festival for the heritage of French cuisine. Bresse in the chicken world is akin to the kobe/wagyu of beef and kurobuta of pork. Many of the world's gourmet experts agree that the best tasting chickens come from Bresse, France. The chickens have an appellation, are of a specific breed, get to eat real food (not chicken feed) and have at least 10 square metres for each bird to roam about, all regulated by law. And honestly, it blew away all inhibitions I had about paying a significant premium for it. 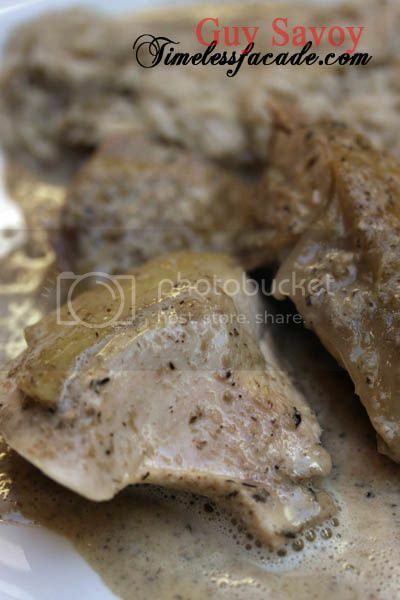 The chicken was first steamed, then baked, retaining a gamey flavour coupled with fine and amazingly tender flesh. 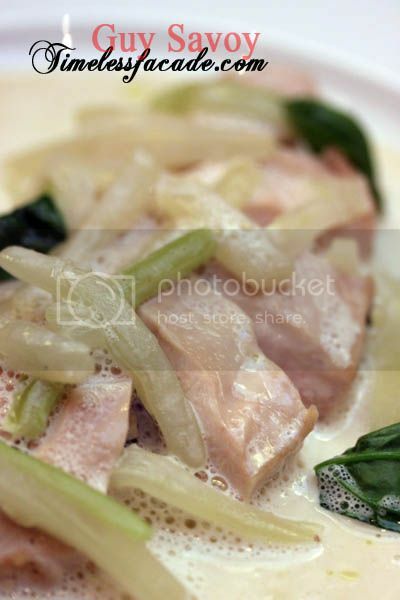 I could make out hints of lemongrass as well and the ribbed vegetables infused a nice crunch to the dish. Our server had this dish done a different way to allow us a different take on this prized chicken, which I thought was very thoughtful of him. This variation was topped with mushroom sauce and long grain rice. I loved the somewhat frothy "mushroomy" taste singing in tandem with the al dente grains of rice but did find the chicken texture a little tougher then the previous dish. Nonetheless, the skin was springy as well which made for a very good dish. This dessert looks deceptively simple. 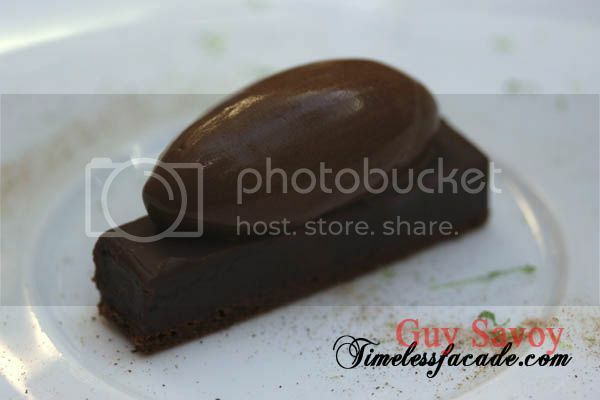 A scoop of chocolate ice cream sitting on a chocolate ganache. In reality, it encompassed a chocolate biscuit made with marzipan marinated with lime juice, chocolate ganache flavoured with cardamon and black pepper, served with a dark chocolate sorbet. The cardamom and black pepper gave it a peckish twist to an otherwise relatively rich and safe dessert. Now this was one very sour dessert and certainly didn't sit well with me because of my intolerance for all things sour. 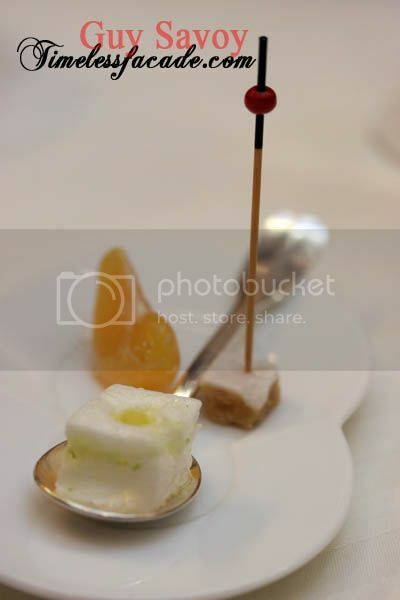 But it was Guy Savoy and Granny Smith, so I had to try.The apple wafers were thin and very crisp, almost ideal for a snack, while the sorbet won me over with its zest and refreshing sensation. As a balance, chestnuts were added to make things a little more bearable for folks like myself. Truly wonderful. And of course there were many other things that came in between the courses as well as the awesome dessert trolley that came rambling out after all was said and done. I had a go at stuff like macarons, zesty lime marshmallows, chocolate tarts and the likes. To those who think that fine French dining wouldn't fill you up, think again. Our much anticipated and enjoyed lunch for 2 cost 300€ or about SGD$630 ($546 for the meal + $84 in tips) in total. 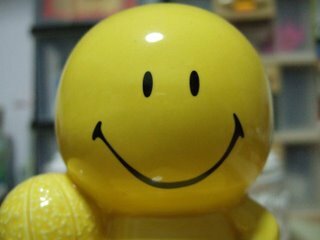 Service was extremely professional and warm which did wonders in alleviating the stress that came with being the only under dressed people around. 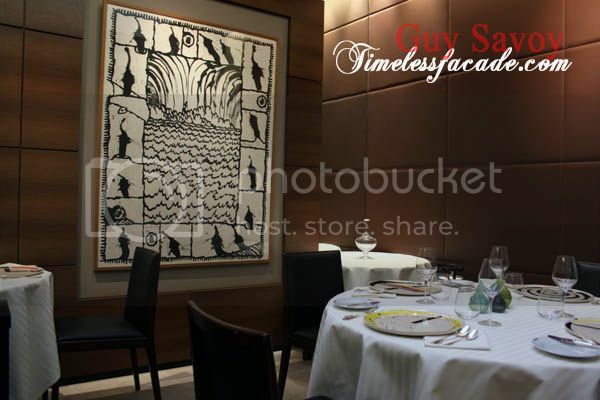 If I may say, our lunch at Guy Savoy was truly a wonderful experience - one that I have yet to experience in Singapore. I await, with high expectations, of its new restaurant in Singapore. 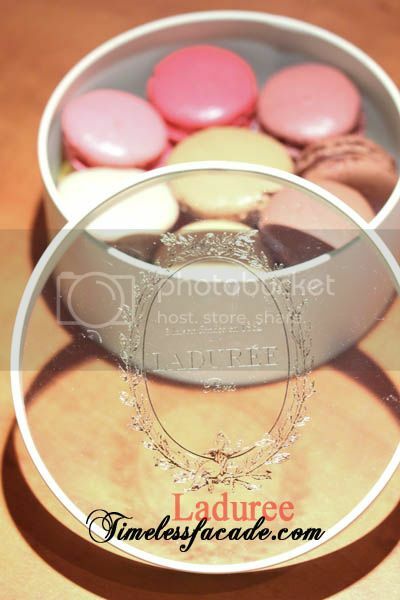 We dropped by Laduree and Pierre Herme after lunch to grab our fix of macarons. 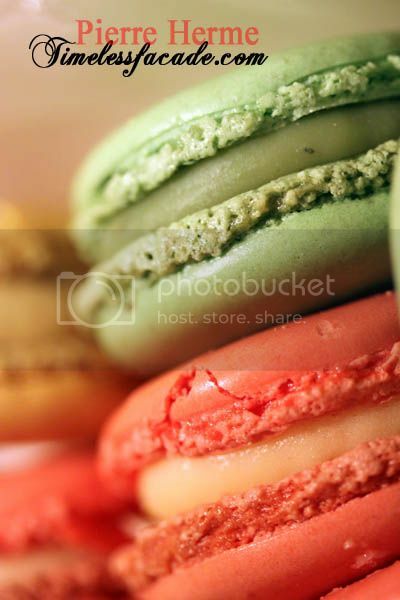 In my humble opinion, Laduree's macarons had a crispier shell but Pierre Herme's macarons won hands down for its intense and interesting flavours. And my favourite? Pierre Herme's White Truffle Hazelnut Macaron! If you would like to see unrelated pictures of my trip to Europe, please see here. that looks super good! whooping price! welcome back. isn't it nice to lay hands on some PH? 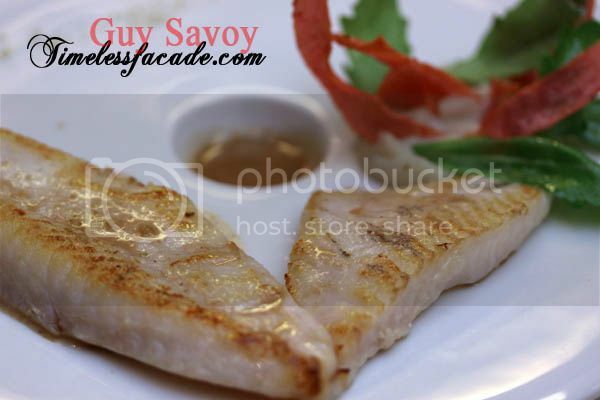 great review on Savoy. reiz: Yea its expensive. I was actually contemplating on Le Cinq for lunch at first but that would have cost more. Around 180 euros/pp. rata: Thanks! Yea it feels awesome to step into PH and see all the pastries that's available. I managed to catch a glimpse of PH himself (I think its him) as well at his Bonaparte shop. Did you make reservation? If so, via online? 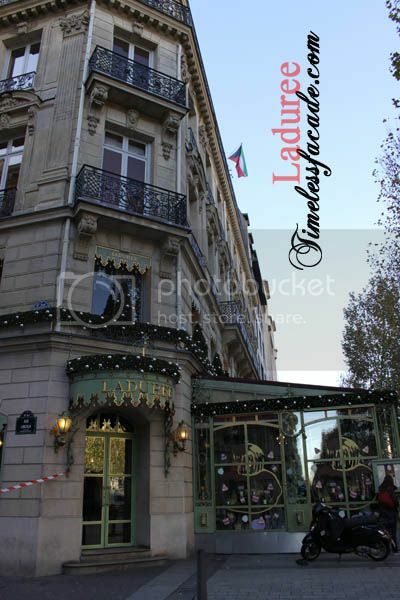 I am thinking of trying a 3 stars Michellin restaurant when I go Paris this year. 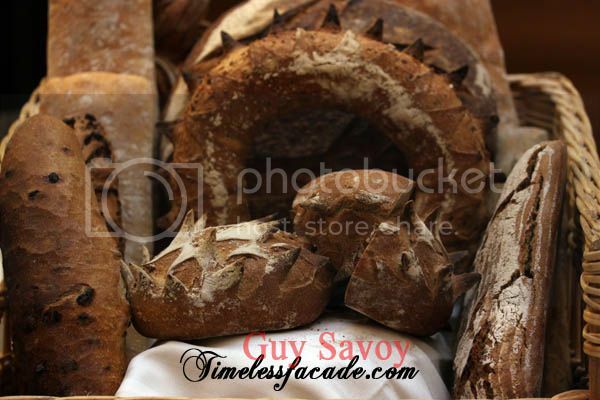 Any other food recommendation in Paris other than Guy Savoy/Laduree/Pierre Herme? You can try Fish if you like seafood. If you like roast chicken, try chez lulu. Another 3 star restaurants that I would like to try would be Le Cinq. If you are looking for a value for money set lunch, try Joel Robouchon (2 stars). Set lunch is 59 Euros per pax. Any guideline for giving tips? You gave $84, 15.38% of total bill which seems quite a lot to me. No rule of thumb for giving tips actually. The French themselves don't usually give tips but if you are pleased with their service, you can give a 10-15% tip. 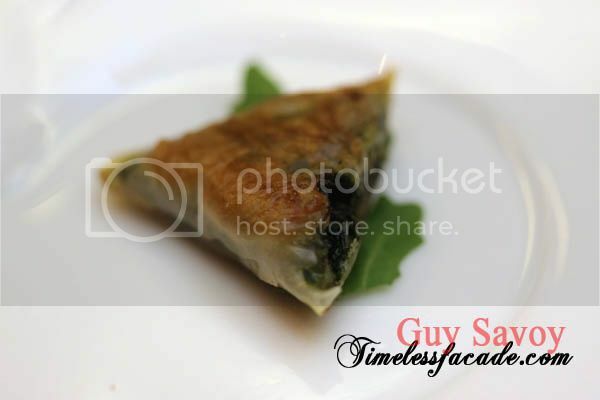 Oh wow, you made it to Guy Savoy! I was in Paris in March last year and was, like you, contemplating between Guy and La Cinq. I eventually opted for La Cinq but fate would have it I met with a nation wide train strike and had to cancel my reservation on that day itself. And I agree Pierre Hermes won hands down for macarons. 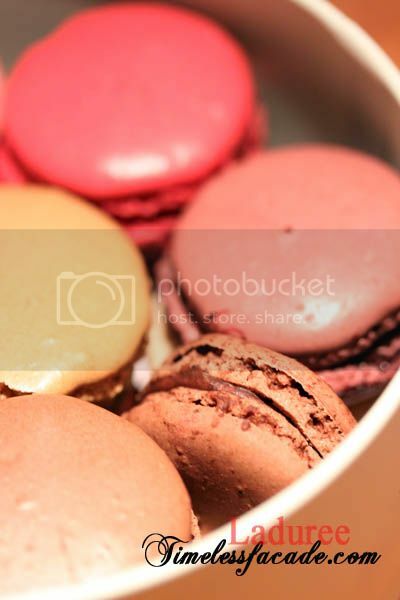 (I love their rose macaron). And you got it... it's an explosion of taste. So, let's see who gets to G. Savoy first when it opens here eh? I normally wait till a restaurant settles down (after a month or two) but I don't think I want to wait in this case. 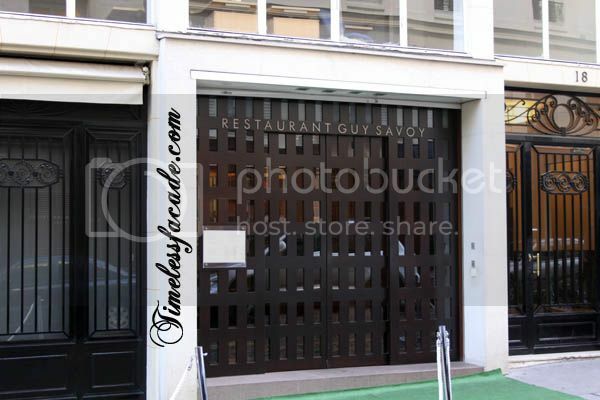 (No news of it's opening date yet so in meantime Robuchon it will be). Hime: What a pity! I would imagine Le Cinq would have been a wonderful experience. Guy will not be doing lunch in Sands, it seems. Instead, it'll be tea with tea pairing (what else). That's something new and I wonder if it's gonna work. Opening date in June if there's no delay. 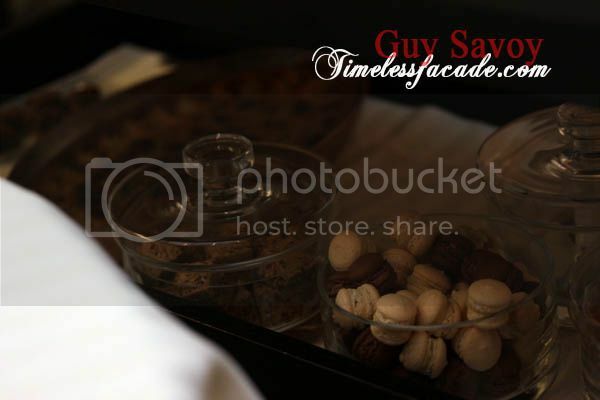 When you arrive at Guy Savoy, you feel first of all like if you enter the Guggenheim or the Tate modern combine with the Louvre, this is a sumptuous combination of Modern art and classical atmosphere. Just sumptuous and relaxing. I can bizarrely remember the weird presence of “burgundy red” all around me during diner. Sometime your memory can be attracted by something you don’t really notice at first instance, however it stays in your mind for life. 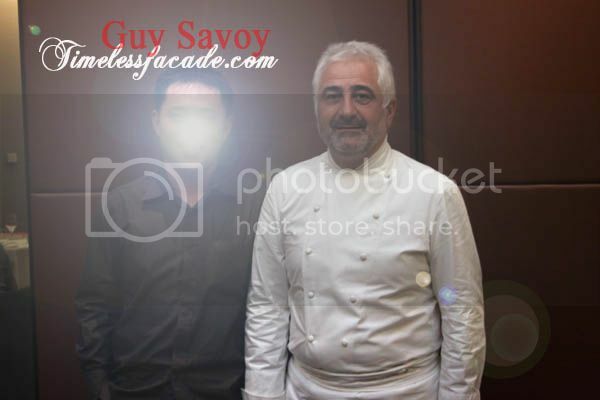 I’ve to say, this moment are in you memory forever and at Guy Savoy, i’ve to confess, this is definitely something I’ll remember. Just recently discovered your site and have been going through your archives. I love your reviews! 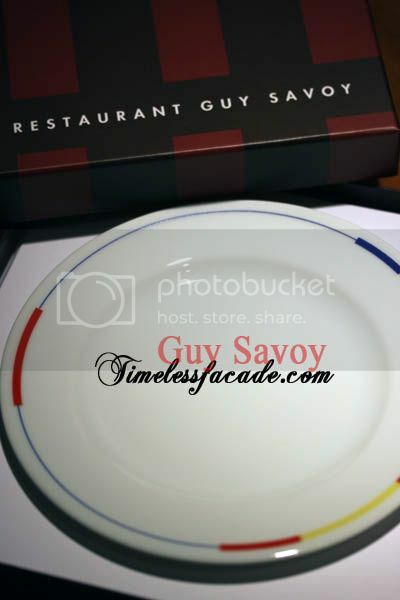 I was wondering if you've had the chance to visit Guy Savoy in Marina Bay Sands? I was intrigued after seeing the high marks you gave to the one in Paris. I've been hearing mixed reviews about the one here in Singapore though, so I have been on the edge on whether I should fork out cash and give it a shot.